Those are the words of Private Arthur.W. Manuel who served in the First World War (or the “Great War” as it was then known) with the Royal Newfoundland Regiment from 1914-1919. In fact, this book would never have been published had not Arthur Manuel’s papers and voice recordings been discovered by his grandson David Manuel in 2011. Dundurn Press has now published his startlingly frank account of his experiences as a front-line soldier, which has been edited and arranged by Bryan Davies and Andrew Traficante. They also supply some introductory notes and explanations throughout the text for clarity’s sake. A Boy From Botwood is exceptional for many reasons, primarily for being an account of a front-line soldier who fought (and incredibly survived) battles in Gallipoli, the Somme, and Passchendaele. Private Manuel was also captured and became a prisoner of war and his detailed account of life in a German “slave camp” (and his failed escape attempt) is remarkable as well, for there is not another account that exists which is so comprehensive. 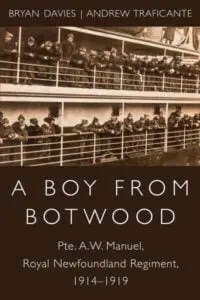 A fascinating, well-told account of the exigencies of war and his time served as a POW, A Boy From Botwood is a true treasure, of equal or more value than any existing historical account for it’s honesty, authenticity, and particularly for Manuel’s survival throughout it all and his forethought to commit it to tape and have it transcribed for posterity. I thoroughly enjoyed it, and it goes on my 2017 VeryBest Book Awards Longlist for Non-Fiction (History).